I've seen him. He needs a guitarist. Then they can play rock music. I wasn't that impressed though because I don't think he was playing anything cool. You know what... the Orchard MRT / Tangs underpass busker person can sing. The busker over in front of Robinsons at Centrepoint can play the guitar well, and he usually plays rock/ballads, just nice to complement Ethan. Maybe the 3 of them can form a band. 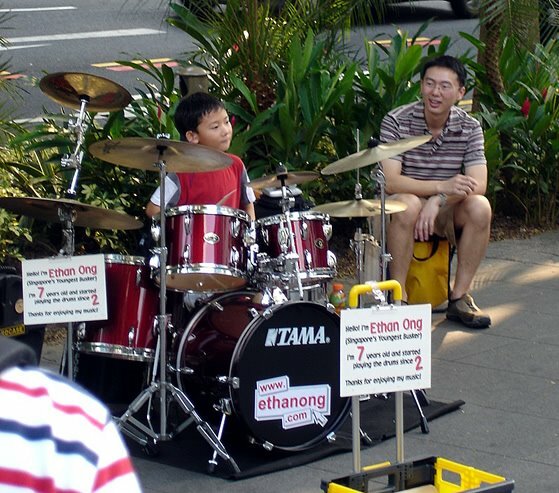 As much as i like this post, the thought that he's a 7 year old busker disturbs me. Is it school holidays or something? I had friends in college that used to busk and they were great!